For most Asian countries, the quintessential summer dish comes in the form of a cold noodle dish. From buckwheat to spinach noodles, from fish paste to cold beef broth, slurping these noodles cools down the sweat on your back. Being the melting pot of many ethnicities, the Los Angeles area is an ethnic dining haven which offers these summer noodle dishes – sometimes year round. Don't let recession stop you from tasting all over Asia. With dishes $8 or under, the only expense you need to worry about is gas. 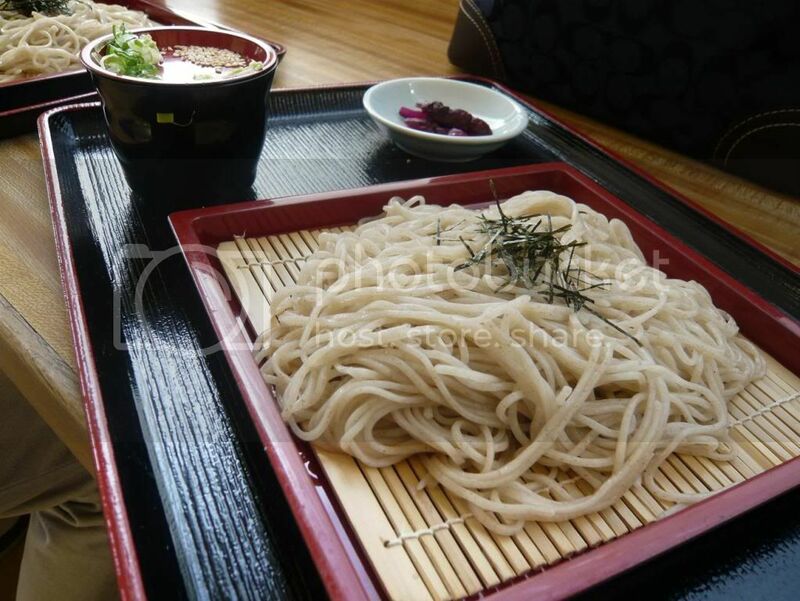 The best place for soba in the area at the moment is probably Ichimiann. This small shop just off of the downtown of Torrance hand makes their soba and udon noodles. A couple of tables are available, but mostly Japanese businessmen would fill up the wooden counter lining the wall. You can get a variety of soba and udon noodle soups, with eel to Japanese sticky yam as an accompaniment. For the summer there’s only one thing to get: zaru soba. The zaru soba is not only a great summer dish, it is also an initiation dish for those new to this buckwheat noodle known as soba. Cold handmade soba is served atop a bamboo tray. A bowl of tsuyu sauce (a mixture of dashi, sweetened soy sauce, and mirin), scallions, and wasabi are provided on the side. Mix in the wasabi and scallions in the sauce, then dip your cool strands of soba in the sauce. This simple dish brings out the resilient texture and flavor of this freshly made soba like no other. The Korean naengmyun are delicately thin yet chewy strands of vermicelli noodles made from buckwheat. 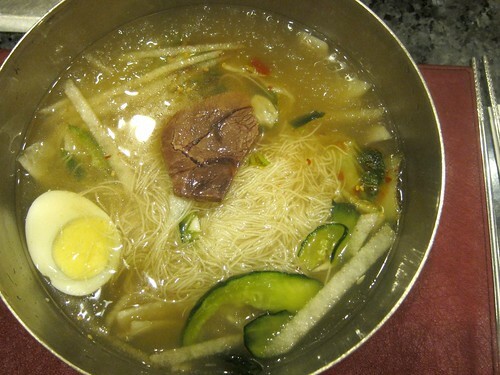 Mul naengmyun is naengmyun served in a cold beef broth along with julienned vegetables, beef slices, and boiled eggs. At Chil Bo Myun Oak, the mul naengmyun is also served with slices of Korean pear. Despite being a popular Korean summer dish, a good naengmyun is still hard to find. Chil Bo Myun Ok takes so much pride in their naengmyun that the noodles are prohibited from leaving the premises. No to-go orders, no take out, the wonderfully supple and chewy noodles must be enjoyed in their metal bowls inside the restaurant that keeps it cool during your meal. The server will ask if you’d like the noodles cut, scissors ready in his other hand. The answer is yes, you’ll need him to. It’s always hot in South East Asia. That’s why you can find bun thit nuong in most Vietnamese places, all year round, but summer is the perfect time to try it. 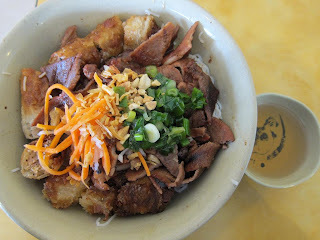 Rice vermicelli is topped with chargrilled pork, julienned carrots, scallions, and crushed peanuts and served at room temperature. Order a bun thit nuong cha gio and you will find sliced egg roll (cha gio) atop your bowl. For a mere $4.99 you will find the top of the bowl generously covered with meat and egg roll. Douse everything in some fish paste and you are ready to go. For the pork lovers and the fish sauce lovers, this one’s for you. At Bamboodles, to keep the dish cold, the plate is served on top of crushed ice to keep it cool throughout your meal. Spinach noodle, as with all other noodles at this restaurant, is made fresh every day. The dough is pounded flat by the chef by bouncing up and down on a bamboo pole – a method developed by a Guangdong noodle chef – and when you’re lucky you can watch him do this through the glass window of the kitchen. 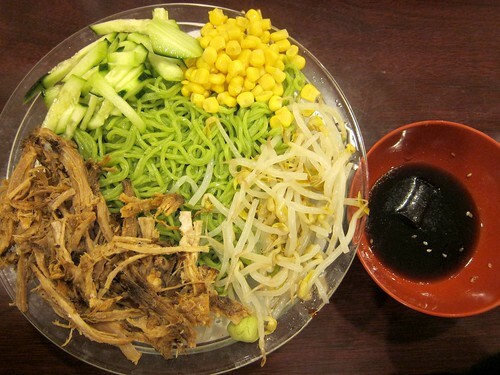 The noodles are arranged on a platter with shredded pork cooked in green tea and sliced vegetables. Mix everything in with the sesame sauce served on the side for a cooling and healthy meal. This place may be most famous for their Thai boat noodles, but don't skip the jade noodle. The delicate, bright green noodles are served dry with bbq pork, roast duck, , crab, and a sweet ginger sauce. Squeeze the lime and mix everything well with the chili flakes. The lime gives the dish a refreshing sourness but not as strong as the one found in the boat noodles. This bowl lets you appreciate the delicate yet springy noodles themselves. Very cool, literally and figuratively, round up! Thanks, Fi! Good idea for a round-up, and nice choices. Ahem, what about the Singapore noodles? I'm dying for some of those jade noodles now. maybe when i return. So those are what the Jade noodles look like!!! Every time I go I am so determined to get them but end up getting my usual instead, ha ha. Nice idea Fiona, I can seriously say there is quite nothing like some cold noodles. It has taken me years to develop my gratefulness for cold noodles!!! Great round up, though at Ichimian I prefer their cold tanuki soba over the zaru one. Yay for cold noodles. Yay for this roundup!